We initially went on a family holiday in 2009 to The Gambia and were welcomed by Alex (Alagie) and Sara (Sainey) into their lives and families. Sainey drives a tourist taxi and Alex works at a beach bar. 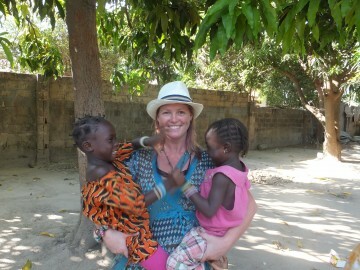 We spent time at Alex’s compound and this gave us an understanding of the Gambian hardships, fascinating culture and wonderful, loving, family life. We were welcomed and fed; and played games with some of the happiest children we have ever met – pulling cardboard box trains and laughing out loud with twinkly eyes and big smiles. We returned many times, delivering items to schools and communities. Items such as pencils, erasers, books, first aid, clothing & shoes etc. And each time we returned we met with headmasters and sponsored children in the local community to go to school which they would not have been able to do otherwise. Realizing the importance of education and many children not accessing school due to finances, and knowing that members of the family get malaria annually as a matter of course – we set the charity up to sponsor children with education and providing preventative healthcare through mosquito nets. As well as specifically requested items such as chalk, books and first aid equipment, we have taken musical instruments to a school for the blind, sensory items and knitting wool & needles to the school for the deaf, and a simple sign language aid to an 8 year old boy who is unable to communicate. We started personally sponsoring children to go to school, built relationships with parents and head masters. We are now at a stage where our links are strong and we have a fuller understanding of their difficulties. Our aim is to establish even stronger links with schools to support the children within the communities, work closer with partner organisations to support communities create a sustainable livelihood.